With experience in six major league seasons behind him, Pete Filson in 1989 found himself playing back in AA. He hadn't been in the majors since 1987, rotator cuff surgery slowing his return. But, there he was with the Royals in 1989, working his way back. "I still like to play," Filson told The Orlando Sentinel in July 1989. "That's the reason to keep going. I'd like to get to Triple-A by the end of the summer to see how I'd fare there. If I'm going to make it back to the majors, people have got to see me." Filson didn't make it back to AAA that year, but people did see him. And he returned to the majors, his work paying off with eight final appearances - seven starts - with Kansas City in 1990, concluding his career. Filson's career began more than a decade earlier, in 1979, drafted in the ninth round by the same Yankees he'd looked to return with in 1987. Filson stayed with the Yankees system into 1982, making AAA Columbus that year before being traded to the Twins. It was with the Twins that Filson first made the majors, in May 1982. He got into five games for Minnesota that year, going 0-2, with a 8.76 ERA. Filson returned to the Twins for 26 outings in 1983, including eight starts. He went 4-1, with a 3.40 ERA. His fourth win came in late September, a 7.1-inning performance where he gave up six hits. His 1984 campaign saw the most time Filson would get, 55 games and 118 innings. He went 6-5 in a mix of starting and relieving. He got two of his wins in a two-day stretch in late April. the second win came in a long-relief appearance, 6.1 innings after the starter suffered an injury. "Filson won the game for us," Twins manager Billy Gardner told The Associated Press after that second contest. "He (kept) us in the game with his strong pitching and he said he felt good so I kept him in there as long as I did." Filson's last lengthy major league time came in 1985, 40 outings with the Twins. He spent 1986 largely with the White Sox at AAA Buffalo, going 14-3 and getting seven appearances in the majors. 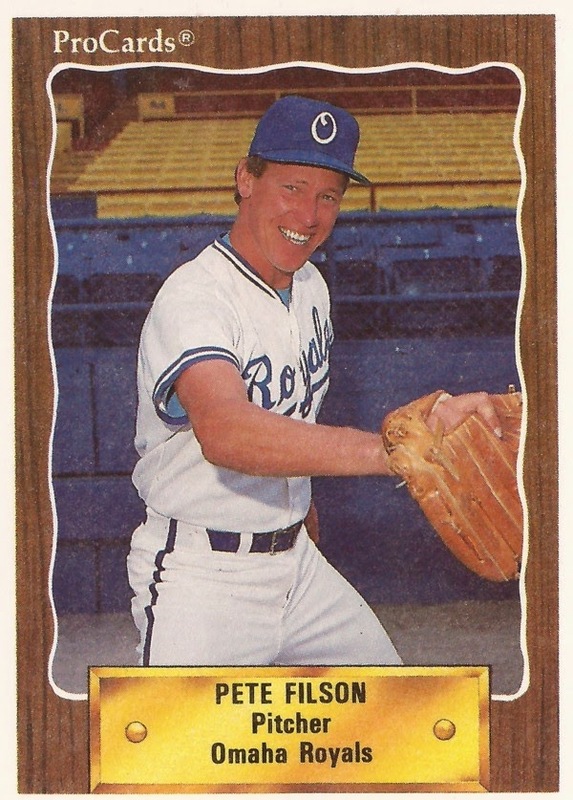 Going into 1987, Pete Filson had worked to become a major league regular again. He'd gone to pitch in the Dominican Republic that winter. By spring, Filson was in Yankee camp, the team that first drafted him, vying for a more permanent return to the majors, The South Florida Sun Sentinel wrote. "I'm running out of opportunities," Filson told The Sun Sentinel that March. "I can't continue to be a fringe-type pitcher. I need to establish myself." It didn't work. Filson only got seven games in the Bronx that year. He lost almost all of 1988 to injury and began working his way back in 1989. In his final season, Filson went 12-2 at AAA Omaha, and 0-4 with Kansas City. Filson has gone on to be a coach with several teams in the minors, starting in 1991 at high-A Baseball City. More recently, Filson served as pitching coach for the independent Newark Bears in 2005.